9/30/2015: Morning Workout: 5:28 a.m., November Project: Quad Torture! 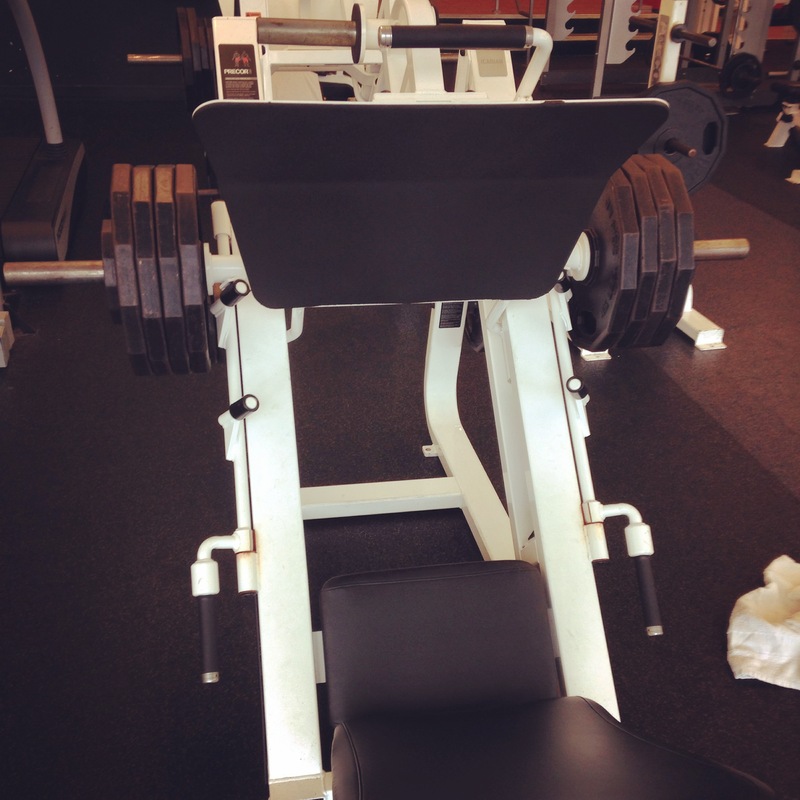 Yesterday I posted a picture of the leg press machine at the gym after loading it up with 380 pounds. Between that, the glute machine (which also works the quads), squats, and the 6.2 mile run from the morning (which was sort of a recovery run after the Bronx 10-Mile), my quads could have used a day to chill. This morning’s November Project NYC workout was all about the quads. We met at the Wards Island side of the 102nd Street walking bridge. Rain or shine! That’s how it works. You #justshowup. This morning: no shine, little bit of rain. Nothing too hard to handle. The workout: Starting on the Ward’s Island side of the bridge, run onto a large turf field to the corner created by the midfield and side lines. 10 burpies. Run across the midfield line to the far corner. 10 crunches. Run down the sideline to the corner kick area of the field. 10 mountain climbers. Run across the goal line to the far corner. 10 squats. Then back to the start. Lunges across the circle area in front of the bridge. Run across the bridge and down onto the East Side walking path. 10 lurchies (lunges performed while making circles with your arms). Run back across the bridge. Lunges across the circle at the other side of the bridge. Repeat for 35 minutes. As you can imagine, between the mountain climbers, squats, lunges, lurchies, and running up and down the inclines on the walking bridge, the quads took a beating. I slowed down on my third loop. Fall racing season takes it toll! A good workout, though! It’s awesome that people showed up in the rainy weather and pushed themselves across the bridge and through all the exercises. That’s the beauty of NP_NYC: When you feel like quitting, you look up and see 20 other people fighting through the discomfort and finding ways to enjoy it, and you just keep going and fighting and trying to smile. High fives help! I also introduced my buddy Eric to the group this morning. 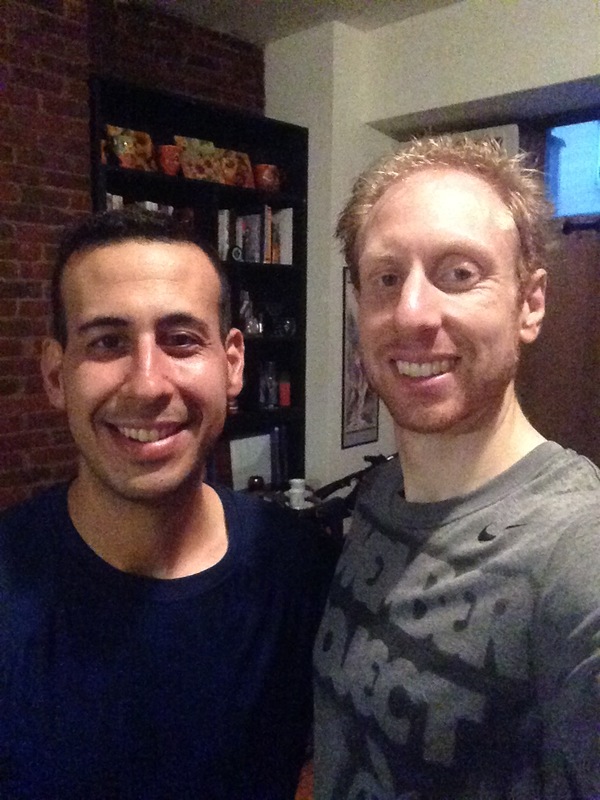 Eric and I went to law school together, and he’s running his first half marathon next weekend in Brooklyn! He reached out about checking out NP_NYC, so we headed over together this morning. At the end of the workout, he was drenched in sweat and had a huge smile on his face. Glad you had fun, Eric! #justshowup and ye shall be rewarded with smiles and hugs from other very sweaty people!